You'd think getting $250 million in capital investments would solve a lot of your problems, but start-ups have more to deal with than just remaining financially solvent. The Orlando Apollos will be forced to practice across the state line in Georgia, citing Florida's exclusion of professional athletes from receiving workers' compensation. State law says that professional athletes are not considered employees, and therefore not covered through workers' compensation laws. Normally, major professional sports leagues with Florida-based teams like the NFL, MLB, NBA, et al, can afford to find insurance companies who will take on the cost of covering every team. The AAF, being a start-up, has not yet found an insurance provider willing to do so. For the Apollos, that means traveling to a hotel in Jacksonville and then taking a bus about 30 minutes to Kingsland, Georgia, to practice. The state of Georgia will cover the Apollos for workers' comp, so long as they spend 51 percent of their practice days on their side. "We really need to make sure we take the necessary steps to take care of our players. Our responsibility is always to do what we must do to make sure our players have the best available coverage," AAF CEO Charlie Ebersol told the Orlando Sentinel. 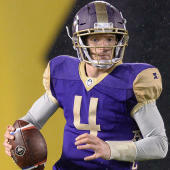 Obviously, this is not the AAF's first choice. The Apollos were already living out of a hotel in San Antonio for a month during training camp in January and now must basically do the same thing all over again. Orlando has just one home game in March, too. This means extra costs for the AAF, but it's the price of making sure that players in a dangerous game are properly insured. During Sunday's 37-29 win over San Antonio, Orlando linebacker Ryan Davis was carted off of the field with a scary-looking injury to his neck/spine area. The AAF has already encountered dozens, if not hundreds, of major hurdles in trying to keep its business going. The insurance issue with Florida is the latest, but certainly not the last.